Events: Gin in June, a Historical Gin Tasting! 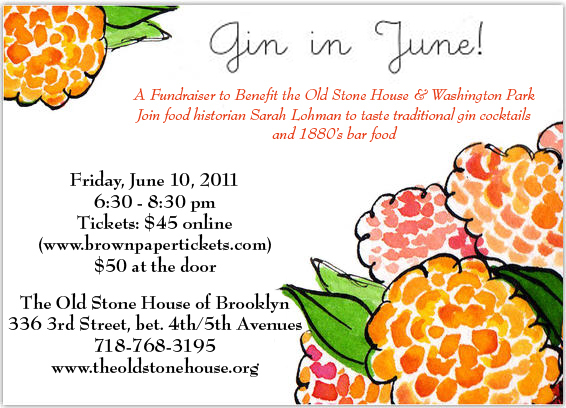 Join us for an evening of historic cocktails at a fundraiser to benefit the Old Stone House & Washington Park! Food historian Sarah Lohman will present a flight of traditional gin cocktails. Guests will sample four gins, including two historic gins and two contemporary gins distilled locally in Brooklyn. Lohman will speak on the history of each liquor and mix it into a cocktail from the past. While guests sip on a Gin Sling or a Martinez cocktail, they can also graze on 1880s bar food: Fresh bread and butter, Pickled Walnuts, Mushroom Ketchup, Beef Tongue, Roast Beef, Pickled Pig’s Feet and Ham. So come drink in history while supporting a local park and museum. Purchase tickets here! I wanted to share a few images from last week’s sold-out Tavern Drinks and Diversion event at the Mount Vernon Hotel Museum. Delicious drinks and food in an historic 1830s bar = pretty awesome. We’re planning another event with hot cocktails for the fall. But in the meantime, if you missed the event and are totally jelly; or if you were there and would like to do it all over, then come to Gin in June at the Old Stone House! On Friday, June 10th, we’ll be tasting four historic gins in four historic cocktails, accompanied by 1880s bar food. Get your tickets here! Guests enjoying a tavern supper of ham, fresh bread and butter, and venison. I made a ham so good. This ham was the best ham. I'm making it again for Gin in June. Mushroom ketchup: salty mushroom sauce. Also available at Gin in June. A lovely bowel of Green Tea Punch in the garden. A class on historic gastronomy at the Brooklyn Brainery, which offers cheap, low-commitment classes on a variety of topics, like tying knots. Ramin Talaie for The New York Times. Got my picture in the paper today–a lovely image in the New York Times from the Historic Gastronomy class I’m teaching at the Brooklyn Brainery. You can read the full text of the article here. The Brainery offers low cost courses on just about anything, from card games to physics. I’m going to teach a couple more classes over the summer and fall, so get on their mailing list to find out when registration opens. Two great events coming up this week! Join us on Sunday, May 15, to enjoy, experience and learn about the Dutch contribution to gastronomy! Sarah Lohman of http://www.fourpoundsflour.com/ will be discussing Dutch contributions to food! Join her to make your own waffle over an open fire using a real “waffle iron” and an old Dutch recipe until 3 pm or the waffle batter runs out! Look out for our next event! 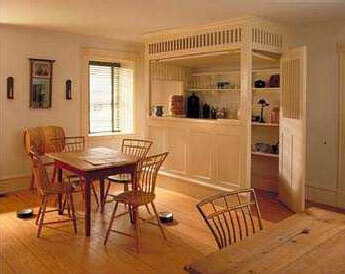 Sarah will be making and serving old Wyckoff family recipes! Fun and filling for the whole family. My first class is called A Timeline of Taste; we’re going to explore the history of American food through flavor: we’ll travel from 1796-1950, making a pit stop every 50 years to explore the tastes of a particular time. Participants will smell and sample the spices, fruits, extracts, and other ingredients that defined the flavors of different time periods. We’ll discuss why each of these flavors were popular and how they were used in day to day cooking. Many ingredients have a flash point that sends them soaring in popularity, pushing other tastes out of vogue: an increase in production, a decrease in cost, a popular recipe, etc. As I was researching the histories of American ingredients, like rosewater, vanilla, curry and ketchup, I realized the results would be a really cool data visualization project. I wanted to see a timeline of when ingredients were the most popular. I plugged in search terms, I was astounded by the visualization of the results. You could often see the exact historical moment an ingredient became popular. For example, from about 1750-1840, rose water was the primary flavoring for cakes and other confections in the United State. While today we associate it with Middle Eastern cuisine, for English colonists it was used as a cheap alternative to vanilla. Vanilla was only grown in Mexico because its pollination was very closely linked to a certain species of Mexican bee. In 1841, a twelve year old slave discovers how to hand pollinate vanilla flowers. Vanilla cultivation is moved outside of Mexico and the product became much cheaper. Look at the chart above: rose water is more or as popular as vanilla until 1841. Then vanilla takes off while rosewater flat lines. A few more fun charts are below. We’ll be talking about these ingredients, and so much more, at the Brooklyn Brainery Tuesday night.